This Monday at Camp Harbor View, we willed and wished for fish. Unfortunately, we were still left fish-less! 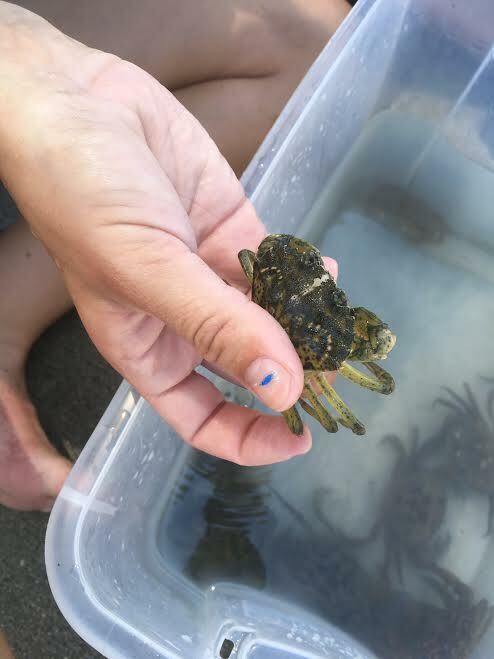 We got our regular lot of rock crabs and had a fun time waiting for any nibbles on the bait though. Towards the end of the day, one camper felt a hard tug and started shouting that he caught something! He pulled with all his might and the kids gathered around hoping for a fish, a shark, anything! As the camper vigorously pulled up the line, we all laughed when we realized he caught... a long piece of kelp! 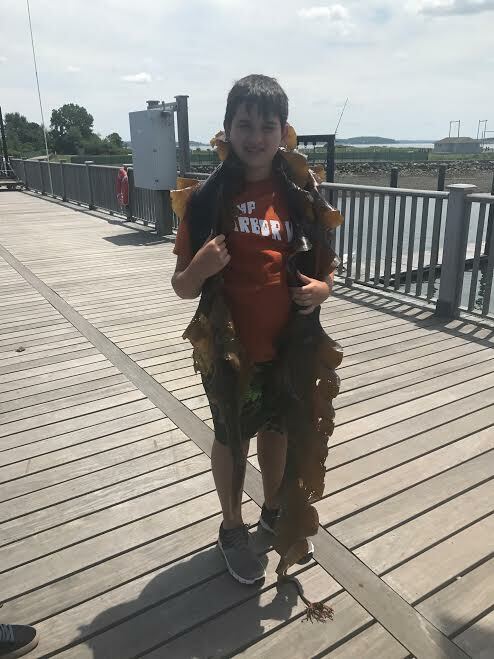 Once he got the kelp on the dock, he proceeded to wear it as a boa and walk around with it on his neck. Once he let the boa rest on the dock, we discussed the parts of the kelp. We learned about the steadfast, the blade, and the stipe. We also talked about and how fast various types of kelp can grow; some kelp can grow two feet a day! Upon examining the kelp further, I discovered a colony of Bryozoa living towards the top of the blade. 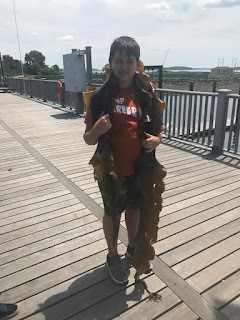 I explained to the campers that this was actually a living organism that was residing on the kelp. When the campers asked what it was, I handed them the guide book and encouraged them to research the answer to their question. After careful deliberation, they told me that this was Hairy Bryozoa. The campers could not believe that something so small and simple was actually alive! I will continue to keep my fingers crossed and my hooks baited in hopes of catching a fish. But until then, I am enjoying learning about all the things that can be found in the sea with all of the children.